BTC - New media developments continue outside of BeatTheChip.org. Plans to merge breaking news of national identity found on BeatTheChip.org will soon become part of another blog, Waking Up Orwell. Waking Up Orwell will continue to cover a wider variety of blog topics such as: corporate and government privacy violations, police brutality, surveillance abuses and national-to-international cybersecurity power grabs. The transition is an attempt to keep the news direction relevant with or without a national identity angle. "There's too much going on in the world. BeatTheChip started as a narrow focused blog exclusively featuring news about Real ID and national identity developments. Over three years, it's run over the scope; becoming more of a digital privacy and civil rights/civil liberties blog," said the site's main blogger, Sheila Dean. Waking Up Orwell (WUO) was originally produced as a radio program covering a broader range of dystopian news originating from BeatTheChip. WUO will continue as a multimedia focal point for a variety of coverage, including netcast productions and original writing. WUO's radio production is rumored to resume in March of 2011 to the dismay of competition and Facebook. "Yes, the one man show is getting the band back together,"said Dean who has endured censorship, online network hacks, treacherous hipster politics of community radio and the overarching news egos of broadcasting fat men to produce the program in the past. Overall, the blog exhibits ambition to set about a more rounded news making standard for online users. Economic performance is grounding prospects for the new media launch. WUO hopes to stay the course by monetizing the blog and program indefinitely. However, safety nets are in place for economic or programming woes. "If things get bad, I'll just have to move back in with Blogger.com," said Dean. For now twitter news feeds @BeatTheChip are now available at Waking Up Orwell Daily on paper.li. 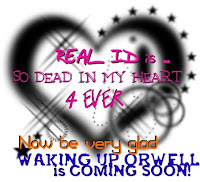 May 11th, 2011: Deadline for Second Coming of Christ or Real ID? BTC - The public is the constant witness of electronic data streaming 24/7 on the Internet. The next line of temptation for governments is to initiate power plays with cyber information and attempt to organize it into a convenient remote controlled system of rulership over the inidividual. A Wikileaks cable uncovered the role of Egyptian dictator Mosni Mubarak's role in allowing harbor for illegal torture of US rendered prisoners. The last straw snapped for Egyptians when Mubarak interrupted mobile communications and the Internet. Mubarak opting for an aggressive Internet kill switch is more than simply grounding Egyptians without electronic amenity. His actions now define despotism to the generations. The net was the last bastion for Egyptian freedom of speech. Civil unrest simply errupted from the cold space of the web directly onto the hot streets of Cairo. After that, the revolution was live in real time and the web caught up later. Egyptians have endured 30 years of dictatorship rule and a normalized “state of emergency" status to control the people. Egyptian youth lately were seen flippantly displaying their national IDs and passports to televised media, demonstrating dissent, and bonafide evidence of an oppressive totalitarian government. Here's an example of how the book illuminates current events. The National Strategy for Trusted Identities in Cyberspace (NSTIC), a national digital authentication initiative, is moving ahead with hires for a national program office. One essayist, Sunni Maravillosa, explores national identity authentication in society in the chapter titled, “National ID without Big Brother”. After reading this, one might gather the purpose of the national program office is to provide government oversight or regulation to an existing organic national identity system designed for business. "In a sign of their new-found confidence, many protesters held up their national ID cards or passports to news cameras, a show of bravery just days after police were detaining and raiding the homes of activists." Canada using national ID registry to track their livestock --"Traceability will give our sheep and goat farmers and exporters another tool to demonstrate the high quality of their products and help them compete in the international marketplace," Ontario MP Pierre Lemieux, the federal parliamentary secretary for agriculture, said in Monday's release." On Japan's national ID number system proposal --The government was to announce, possibly on Friday, a set of basic principles for the proposed introduction of a national identification number system as a means of tracking individual citizens' social security, income and asset information for welfare and taxation purposes. BTC - In a legislative recalculation, a proposal to retroactively defund appropriations for the Real ID hubs did not pass as previously anticipated, according to Jim Harper at the Cato Institute. The defunding proposal was expected to pass as part of an annual budget bill drafted by Democrats before the 112th session commenced. In an effort to fight overall budget expenditures, Republicans worked instead to pass a temporary spending measure over a year long budget. Congress is expected to resume discussion of the annual budget in March. "This might be the first government IT project ever that came in under initial cost estimates. Perhaps the reason is that the states did not want to implement REAL-ID in 2005, so they overstated the costs. BTC - Voting is not a matter of national security. It's in your longterm interests to make sure it doesn't suddenly become an issue of national security. I think that's how coups happen. 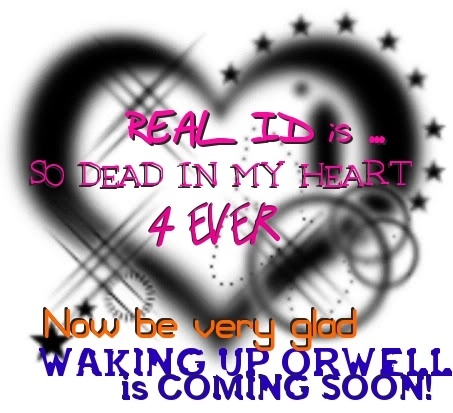 c/o Ken Bonner at The Daily Sentinel on Real ID, NSTIC and the burgeoning surveillance state. It’s not about party affiliation — it’s about control. “This session we have real problems that require real leadership. The people of Texas want us to work on those issues, not focus on narrow, partisan games. Voter ID is not an emergency and should not be our first priority." "Why is Voter ID an emergency?" Why Texas is behaving so badly.